The original structure on this lot, which is a partof the current house, may have been built before Davis was founded. Norman Andrews’ parents, Walter and Gussie Andrews, bought the house in 1948. What is the early history related to this house? The early history of this house is unknown. A 1907 map shows a house on the property, but not the same structure that is currently there. Anecdotal information suggests an original one room house, built there possibly as early as the 1850s. In 1885 to 1895, the three south rooms were added. Additions were also added between 1933 and 1945. Norman’s parents had been living at 231 K Street, a block down from this house, when they bought it from the Willows. Their neighbor, Mrs. Bertha Gordon, told them that she thought Mrs.Willows, the headmaid at the St. Francis Hotel in San Francisco, wanted to sell the house. Although her divorced husband, who lived on the property in a cabin in the back of the house, did not want to sell, Mrs. Willows was apparently interested in selling and did so to the Andrews. Norman and Muriel built the house next door at 1015 3rd Street in the early 1950s. Walter Andrews died in 1968. 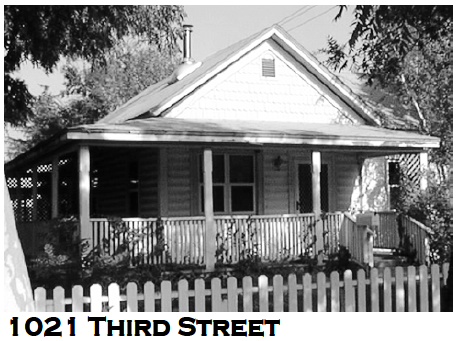 Gussie Andrews continued to live in this house until she died in 1981. What has happened since the Andrew’s lived here? Jim Gray bought the house from the Andrews after their parents died. He did a lot of work to restore the house. The house has changed hands several times.